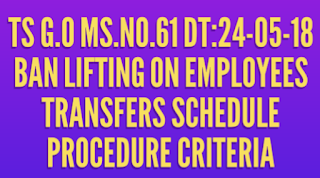 Government Of Telangana Released G.O Ms.No.61 Dated:24-05-2018 for Ban lifting Of Employees Transfers, Schedule Procedure, Criteria, in Telangana. ii. Employees transferred and provisionally ordered to serve in new districts during October, 2016.
vii)Employees working in hardship areas. Each department will identify such areas for their employees. i. 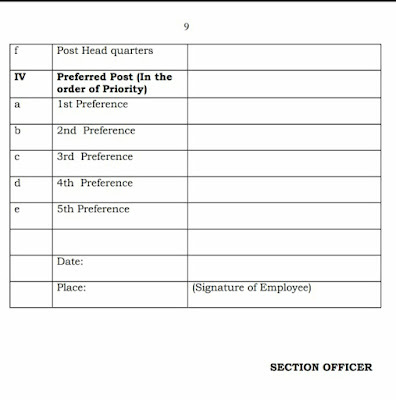 The HoDs / Competent Authority shall publish the list of incumbents working category wise and cadre wise, in all units under their jurisdiction, along with place and duration. ii. Similarly, all clear vacancies shall also be published before seeking options from the employees. iii. The Competent Authority shall publish a list of employees to be compulsorily transferred. iv. The Competent Authority may obtain upto five options for preferential places of transfers from the employees in the prescribed proforma in Annexure-II. However, the Departments may modify the proforma according to their specific requirements. v. The competent authority shall ensure that minimum operational staff is available in offices/ and functional units even in the hardship areas. vi. In case, adequate personnel do not opt for hardship area, the system of lottery shall be followed for effecting transfers. vii. All transfers shall be done by counselling in a transparent manner. Wherever possible, counselling will be done on online/web based application. viii. To ensure transparency, all the notifications shall be published online or on the office notice board. a) Based on this transfer policy, Education Department will formulatedetailed operational guidelines for transfer of Teachers/ Lecturers. transfer of police personnel separately. c) The above mentioned departments, wherever required, may modify the existing Government Orders to meet their departmental requirements. Recommended For You: Download Copy of G.O.Ms.No.61 Dated: 24-05-2018. (1) Spl.C.S. / Prl. Secretary/Secretary of the Department. (3) Addl./Joint / Deputy Secretary as nominated by the Secretary concerned. (1) District Collector of the erstwhile District as per G.O.Ms.No.92, General Administration (SPF-MC) Department, dt.27-03-2017 will preside the committee. (2) The District Collectors of the new districts reorganized out of the erstwhile districts shall be the members. (3) The District Head of the department of the erstwhile district as per G.O.Ms.No.92, General Administration (SPF-MC) Department, dt.27-03-2017 (convener). distribution of the cadre, among all the new districts falling within the erstwhile district/zonal unit. (25-05-2018 to 31-05-2018) : Finalizing operational mechanism based on the G.O.Ms.No. Finance (HRM-I) Department, Dated:24-05-2018 by the concerned departments, in consultation with the Unions / Associations. 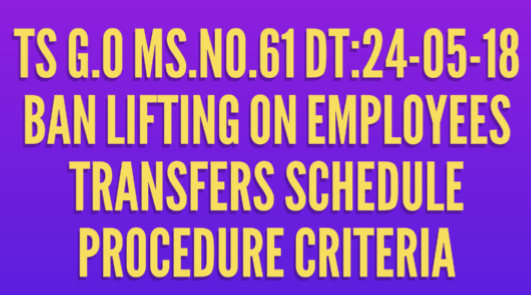 Preparation and publication of Incumbency particulars, clear vacancies and list of the employees to be compulsorily transferred. 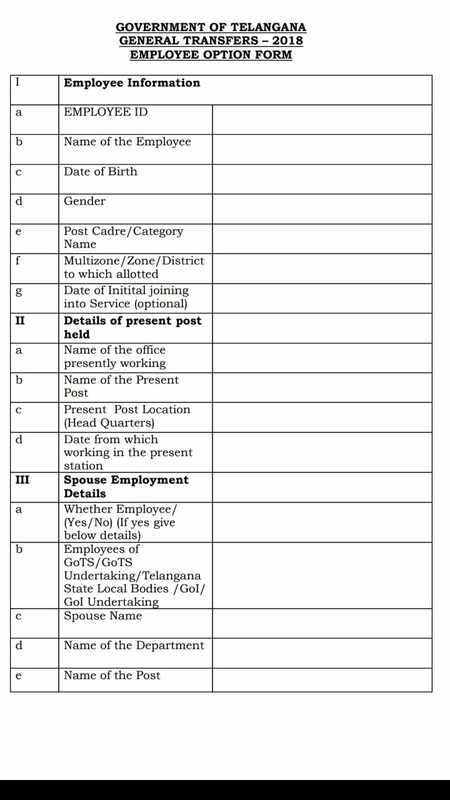 (01-06-2018 to 05-06-2018) : Submission of applications with option by the employees. (06-06-2018 to 12-06-2018) : Verification of Applications and arranging, as per transfer policy and preparation of master list accordingly after counseling. (13-06-2018 to 15-06-2018) : Issue of transfer orders, and 3rd day of issue of orders employees shall be deemed to have been relieved from the previous station. Download Copy of G.O.Ms.No.61 Dated: 24-05-2018.